This serum is a blend of some of the most powerful oils to turn over skin faster and provides vitamins that are proven to cause the skin to generate new skin cells in record time. Retin-A can also be a wonderful treatment for acne, but I have to warn that it can be amazing for acne, or it can make it worse. It is definitely worth a try as the positive results can be dramatic. (decrease wrinkles) and provide a "brighter" more youthful tone to skin. 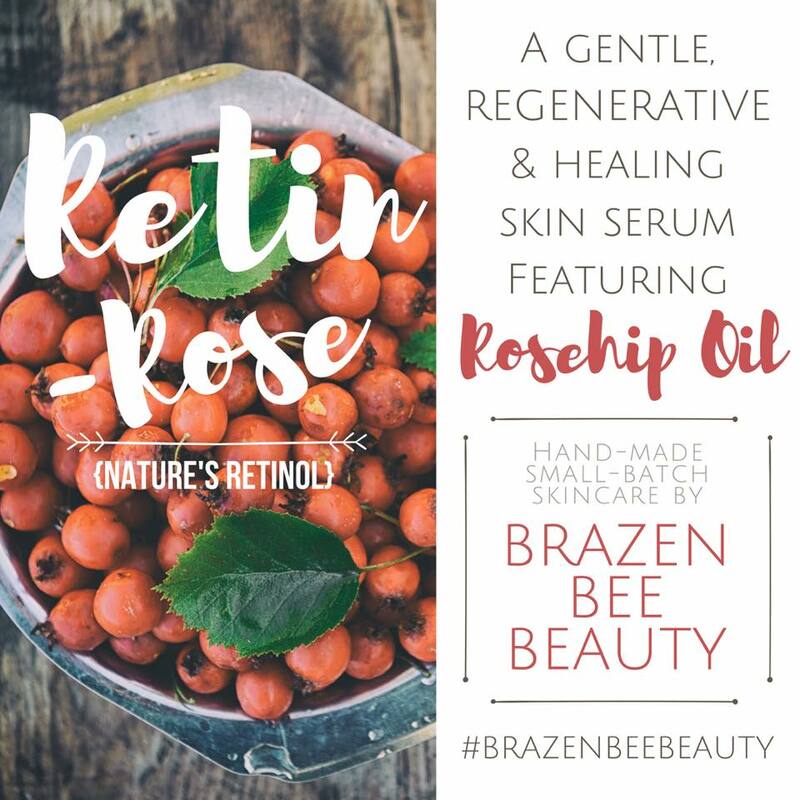 Rosehip Seed Oil is one of the only ways to naturally deliver retin-a (aka retinol) to the skin in a gentle form. Sea Buckthorn Oil is newly added to Retin-Rose because I found that it contains some types of vitamin A, Vitamin C, high Vitamin E, strong Anti-Oxidants and Omega Fatty Acids that are hard to come by. Sea Buckthorn is ripe Omega 7, which is a proven treatment for burns and wounds. What this equates to in your daily use is that it is capable of treating acne blemishes and even old damage from sun-burns. Buriti Seed Oil is particularly high in vitamin E and this replenishes the skin and provides another healthy dose of topical Vitamin A. Buriti oil has also been proven to protect the skin from damaging UVB and UVA rays. Camellia Seed Oil (from seeds of green tea) has been used for centuries in china as a beauty oil. It not only possesses the right molecular weight to be absorbed by the skin but is high in vitamin D, B and Omega 3, 6, and 9. Camellia Seed Oil has also been studied for its antibacterial and anti-yeast properties and proven to be extremely viable as use for both. Aging skin also has a propensity for being less able to fight off these types of infections and would likely be a good candidate for use in issues like Tinea Versicolor. Tamanu Oil is included in this formula for studies showing that it greatly reduced the appearance and instigated healing of aged scars. Argan Oil is well known in the skincare industry for a myriad of skin, hair, and nails benefits but we have included it here because of studies showing that it chemically inhibits the over-production and skin containment of melanin helping with malasma and other hyper-pigmentation issues that often occur with age (age spots). Cucumber Seed Oil is abundant in phytosterols which rejuvenate the skin and strengthen the lipid barrier- this means a stronger collagen type and increased firmness. I’m in my mid-thirties and I’ve had acne since I was a teenager. After only a few nights of using Retin Rose, my skin is clear... it’s like magic! I love how light this feels as a moisturizer. My skin absorbs it quickly and feels so nourished. I’ve been using Courtney’s products for years and was curious about this one but had held off on trying it due to the price. I’m sooo glad I finally tried this as it seems to be exactly what my skin needed and it is more than worth the price! New favorite. I love the Retin Rose Serum! I have been using it on the backs of my hands, chest, and neck—a little goes a long way! The skin on my hands is already looking far more hydrated and smooth. I also use 1-2 drops on my face after using the Blatant Toner, sometimes spraying the toner in my palm and mixing in a drop or two of the serum. Overall, I love how this makes my skin look and feel. I have only been using this product for 2 days but I already love it! I use a few drops at night and it leaves my skin feeling super soft and smooth. I love how moisturizing it is and how well my skin absorbs it. It feels awesome and not greasy or heavy at all. I will update once I have used it for longer but so far I love it! This is my favorite product! I use 4 drops each night and rub it on my face and neck after washing and it makes my skin tingle, in a good way! You can tell it is powerful and my skin is glowing! I love love love this serum. I have tried quite a few and nothing compares. I only apply it at night before bed with some vitamin E lotion and my skin is just radiant when I wake up. Not too greasy and just enough to give my skin the love it needs. I love the Retin-rose serum! As a new mom, my skin can use all the help it can get to look moisturized and revitalized. I use it nightly and often in the daytime. My skin soaks it up well, so it doesn't feel heavy or greasy. I notice a distinct difference on mornings when I use it- my skin tone looks more even and my skin overall looks more plump (in a good way). Thank you, Courtney, for a great product!